Ah, yes, Summertime. And, not only that, Summertime in Florida! 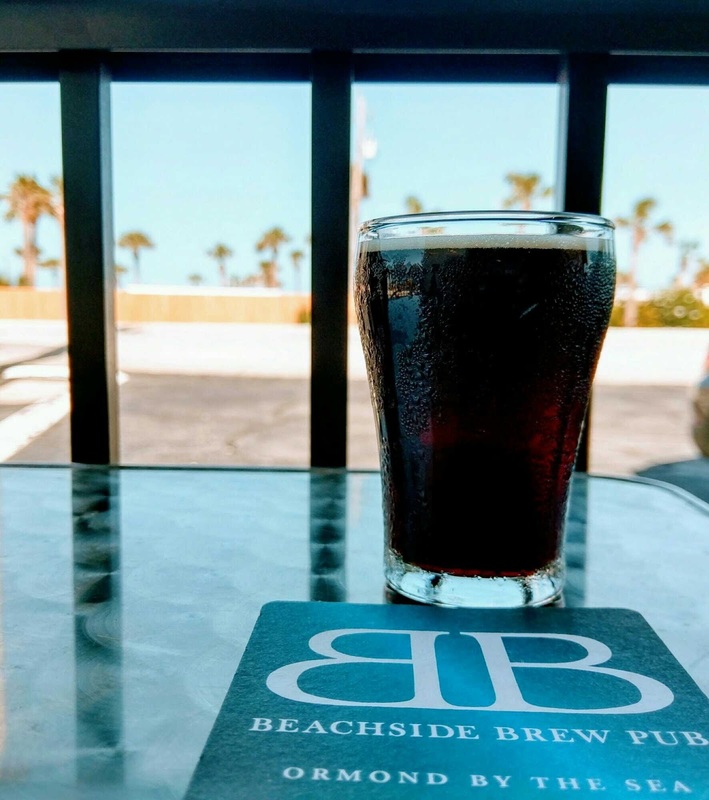 Ocean breezes, sand between your toes, endless horizon, beach umbrellas ... and, of course, some cold beer to go with your beach day. 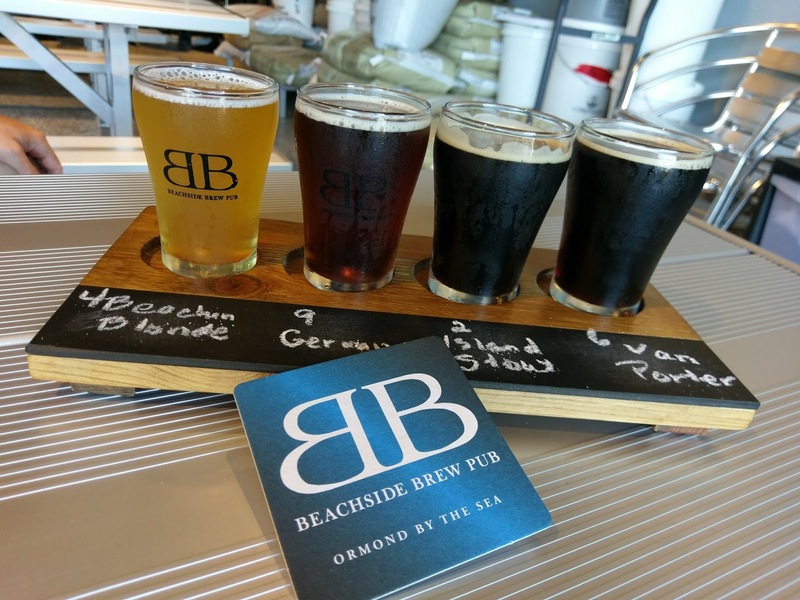 Along scenic Highway A1A in Ormond-by-the-Sea, you'll find Beachside Brew Pub, a small brewery with some big-tasting beers. 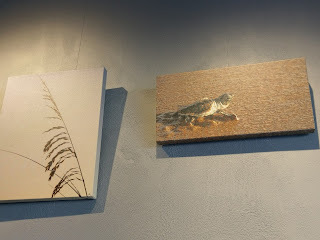 But, don't just wait for a beach day to head over to this place, because anytime is a good time to make a visit here. 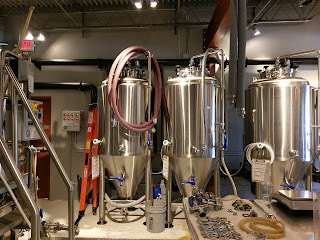 I enjoyed my first stop so much that recently, I made a second trip, finding new brews on tap. 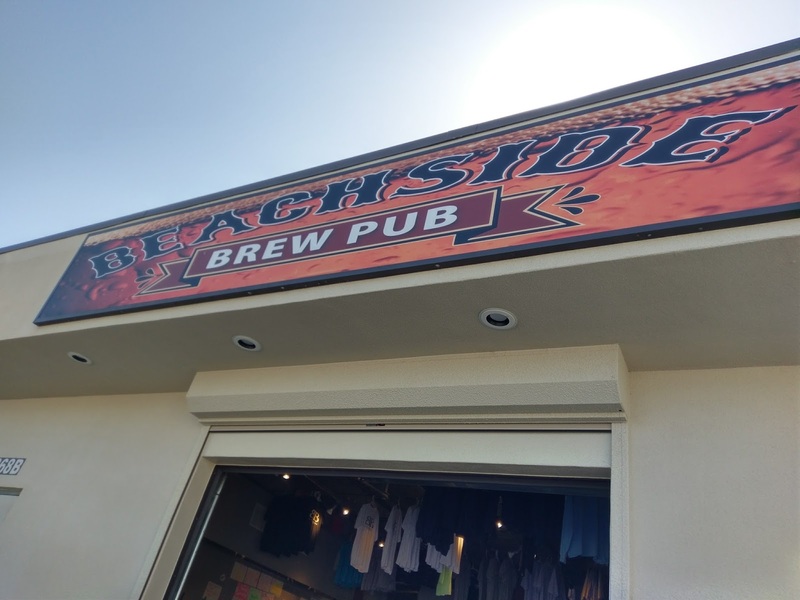 The brewery is located at the corner of a small shopping center across from the beach. It's laid-back and casual, as you might expect. 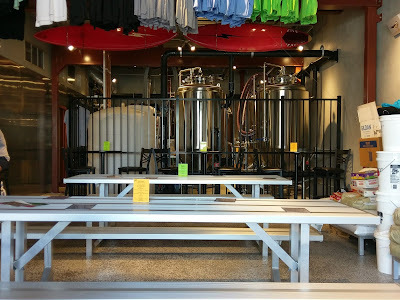 Outside are a couple of tables on a porch, and just inside the rolling garage-style door is a tap room with a three high top tables and chairs, three picnic tables, and a 12-seat bar. All in all, it's around 2200 square feet. There's a TV on the wall (mostly showing sports), and, on both of my visits, classic rock was playing on the speakers (yeah!). Bags of malt are stacked along the tap room wall. Works of art featuring beach scenes and wildlife by local photographer/artist Paul Rebmann add to the beachy nature (by the way, I even met Paul on the second visit!). 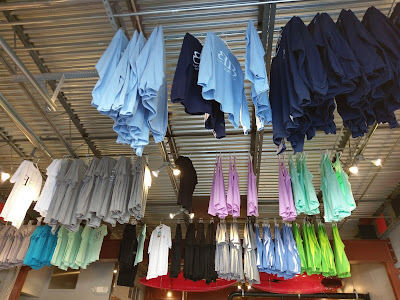 The brewery makes good use of space by hanging merchandise for sale from the ceiling, and the shirts may be gently swaying in the breeze when the door is open. 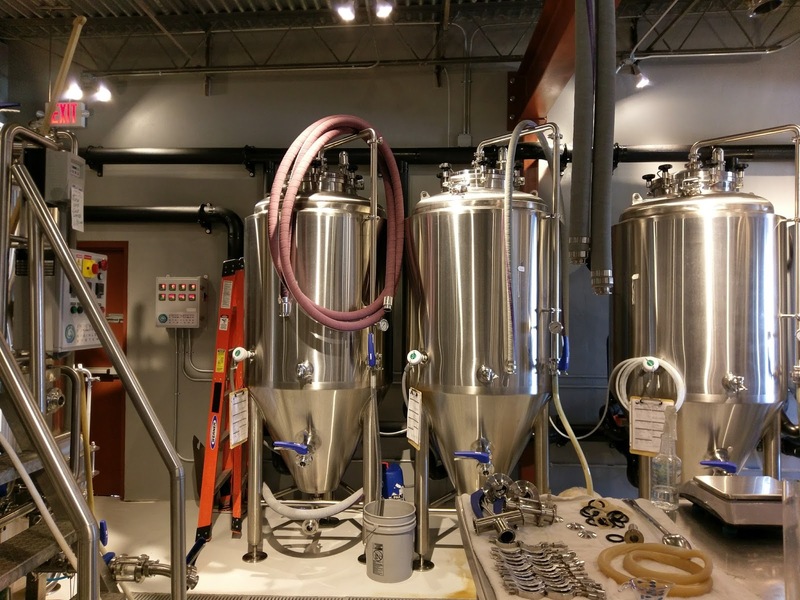 On any given day, Manager/Head Brewer Dan McGrane is likely to be on site, either working in the 5-barrel brewhouse or chatting with guests in the tap room. The tap room features three core beers on its 10 taps, and also serves wine. 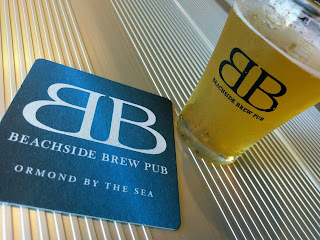 The Beachin Blonde Ale (5.8 ABV; 10 IBU) is a bright and light all-around go-to type of beer, slightly fruity and crisp. You guessed it -- it's a solid beach beer! On the malty side is Gleaming the German Cube (6.2 ABV, 21 IBU), an Altbier, which is also a little nutty, with a subtle bitterness on the backend. Rounding out the core beers is the Citrus League IPA (6.8 ABV, 90 IBU), an assertively hopped beer that's still easy enough to drink. In addition, you may find the likes of Island Stout (5.5 ABV, 25 IBU), a "tropical coffee" stout with hints of flowers; Lunatic Fridge Red Rye IPA (6.3 ABV, 71 IBU), one that red ale-lovers will love, a malt-forward ale with a spicy character and a noticeable, but yet slight, hoppiness at the finish; and Vanilla Porter (6.3 ABV, 24 IBU), having a roasty aroma, prevalent vanilla flavors, and a touch of sweetness. 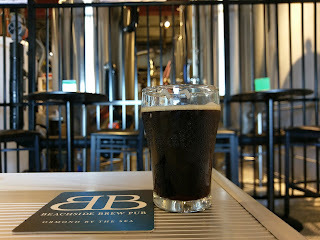 On the smooth, roasty, coffee, chocolate side is the Breakfast Stout (5.9 ABV, 24 IBU), with what my tasting notes call a "heavenly" aroma, a full mouthfeel, and flavors that are very complementary to each other -- definitely do-able even for breakfast, but highly enjoyable anytime of day (picture a sunset, maybe). The brewhouse is visible just on the other side of an indoor fence, and includes five fermenters and 10 serving/brite tanks. 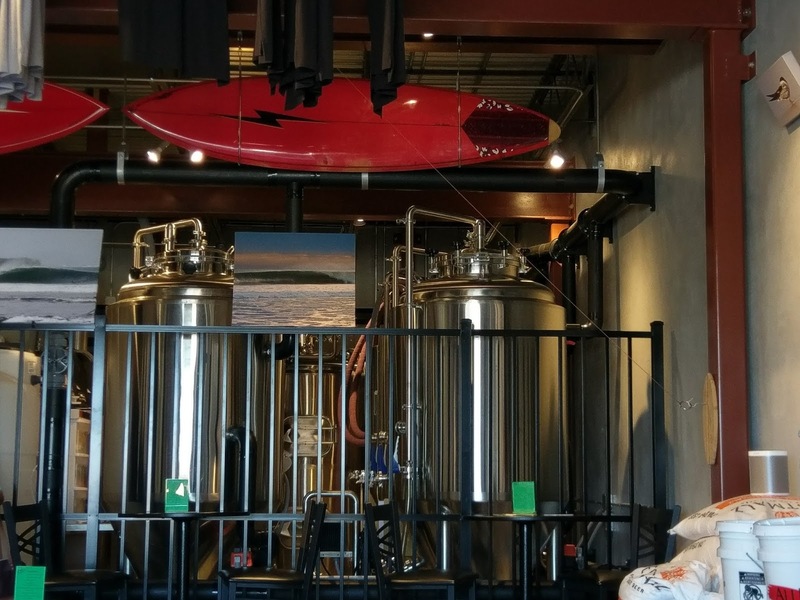 The tap room is a great place to watch hang-gliders and pelicans floating or soaring over the beach, just across the street. Beachside Brew Pub celebrated its first anniversary on July 7, and, from what I heard from some of the guests, it was one rockin' party, with new beer tappings, music and food. This just might be one to mark on the calendar next summer for Year 2. Beachside Brew Pub is located at 1368 Ocean Shore Blvd. (Highway A1A) in Ormond Beach. Food trucks are on site every weekend. 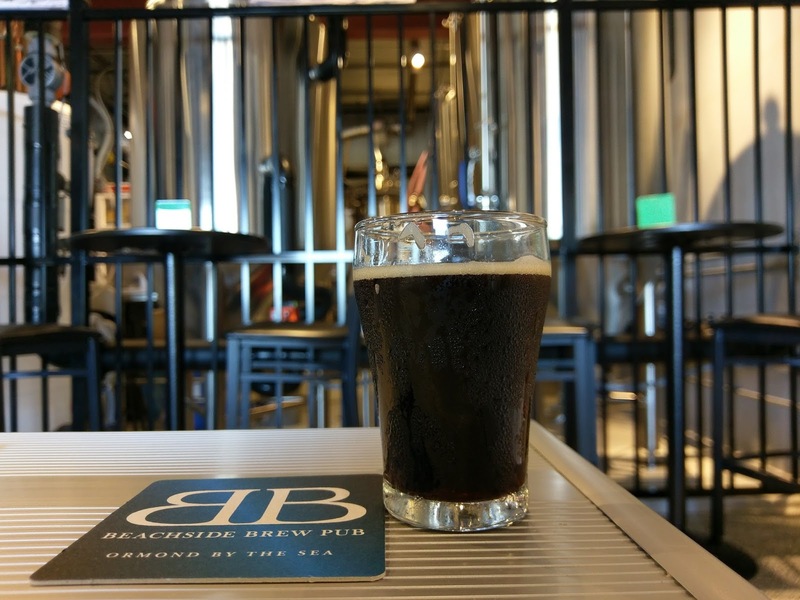 The tap room is open six days a week starting at 3pm, and 2pm on Sundays, closed on Mondays. 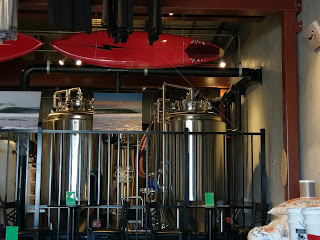 What a cool place, with some awesome beer! If you're travelling along Highway A1A in Volusia County, be sure to include a stop here. 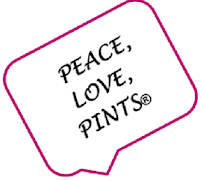 Hey, see you in Florida Somewhere, around a beer! In the meantime, keep checking those events on the two events pages of Brewnymph.com!